Sideman is a quaint and picturesque town nestled in the foothills of the majestic Mount Agung of East Bali. The town is surrounded with lush green rice fields and vast agricultural lands. 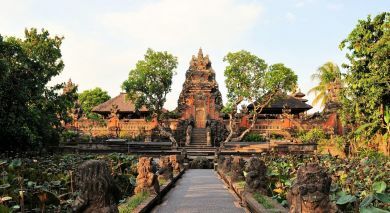 You will see little temples perched on boulders dotting the greenery. Walking trails, mountain views, mesmeric valleys of the Unda River, and coffee and cocoa plantations add to its scenic beauty. Connect with traditional village life on a stroll in the by lanes, lined with thatched huts. 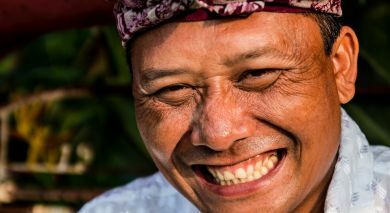 You can chat with the friendly Balinese villagers and learn about their rituals and beliefs. Subak Tabola Villa, set in tropical surroundings overlooked by Mt Agung, offers you a relaxing and refreshing stay. 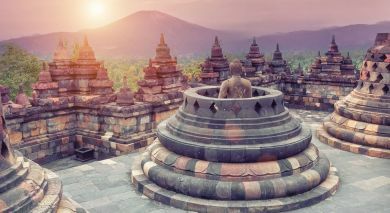 The boutique resort is built in traditional Balinese styles, designed with traditional artwork and local craftsmanship. Surya Shanti Villa is a family-owned eco-conscious resort nestled on the forested hill slopes of eastern Bali in Sidemen, Indonesia. Check into thatched twin-story villas that open out to verdant paddy fields. 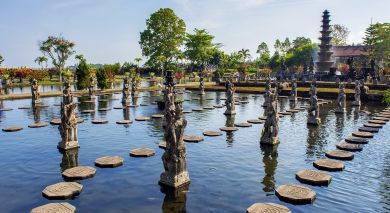 Wapa di Ume Sideman is tucked into a verdant hillside surrounded with terraced rice fields and forested hills in Bali. Stay in ensuite Lanai rooms equipped with a private terrace and balcony overlooking rice paddies or lush rainforests.